Heat oven to 425°F. Remove crusts from pouches; unroll on work surface. Pat or roll each crust into 11 1/2-inch circle. With 3 1/2-inch round cutter, cut 8 rounds from each crust; discard scraps. Fit rounds into 16 ungreased regular-size muffin cups, pressing in gently; prick sides and bottom with fork. Bake 7 to 9 minutes or until edges are golden brown. Cool 1 minute; remove from muffin cups to wire rack. Cool completely, about 15 minutes. Meanwhile, in 1-quart saucepan, melt chocolate over low heat; cool. In small bowl, beat butter with electric mixer on medium speed until fluffy. Gradually beat in sugar until light and fluffy. Beat in cooled chocolate and vanilla until well blended. Add eggs, one at a time, beating on high speed 2 minutes after each addition; beat until mixture is smooth and fluffy. 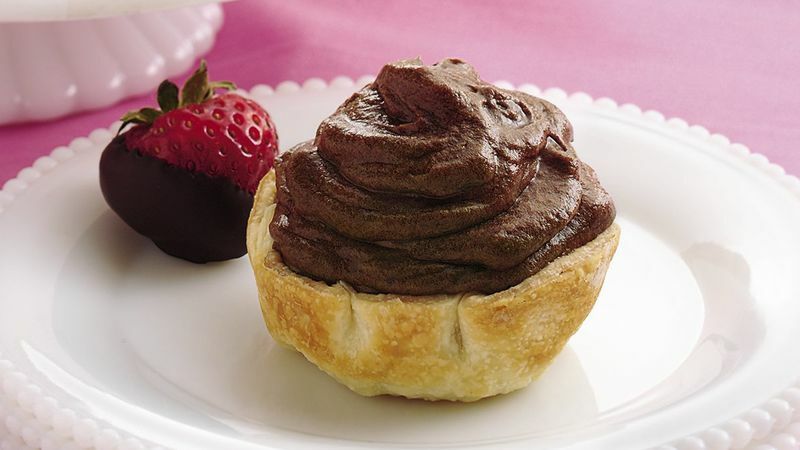 Fill tart shells with chocolate mixture. Refrigerate at least 2 hours before serving. Store in refrigerator. *It is not safe to eat uncooked eggs. Because the eggs in this recipe are not cooked, pasteurized eggs must be used. Pasteurization eliminates Salmonella and other bacteria. You can find pasteurized eggs in your grocery store next to the regular eggs. Place a chocolate-dipped strawberry on top of each tart.